Spring & fall are good times to control fire ants! “April and September are good times to apply baits, once at the start of the season and toward the end to help control before they come back in the spring,” said Will Hudson, a professor with the UGA College of Agricultural and Environmental Sciences. Fire ants are most active in warm weather. Fire ant season can last 10 to 11 months out of the year in the most southern areas of Georgia. Controlling ant colonies before they produce a mound is important. However, Hudson says that once a treatment program is in effect, timing is not all that important. The general rule of thumb is if the area is one acre or less, don’t use baits. Re-infestation is more likely from colonies outside of the yard when baits are used. To eliminate mounds completely, apply baits every six months, Hudson said. “There will be invasion in the meantime, and you will still have fire ants, just not enough to create a new mound,” he said. Hudson recommends treating lawns smaller than an acre with a registered insecticide in a liquid solution. This should rid the lawn of fire ants for one to three months. If you choose a granular product, measure carefully to be sure you apply the correct amount of material and get good, even coverage, he said. The least effective treatment option for most people is individual mound treatments, according to Hudson. Treating mounds in general is going to be an exercise of frustration, and killing an entire colony by treating just the mound is a challenge, he said. Baits are considered to have minimal environmental effects for those who chose not to use hazardous chemicals. Once the bait is out, there is hardly anytime for anything to come in contact with it before the ants get to it. Nonchemical options include using steam or boiling water. “We recommend using boiling water to treat a mound near an area such as a well where you do not want any chemicals,” Hudson said. “Using hot water is very effective, but the problem is you are not always able to boil the water right next to the area you want treated.” Carrying the boiling water can inflict serious burns, so extreme caution should be used when treating with this method. There are products on the market that are approved by the Environmental Protection Agency and labeled as organic. Hudson says organic designation is a “slippery” definition. There is an official USDA certification and many states have their own set of regulations when labeling a product as organic. This labeling can mean the product is either a natural product or derived from a natural product. “While there are a few products that qualify as organic, with most baits the actual amount of pesticide applied is minimal,” he said. Hudson says to be careful when choosing a product because the labels can be confusing, even deceptive, and it is difficult to make the right choice. For assistance in selecting a product, contact your local UGA Cooperative Extension agent. With this winter’s unusually cold temperatures, the question of how these conditions affect insects is sure to arise. It is of little surprise that our native insects can usually withstand significant cold spells, particularly those insects that occur in the heart of winter. Insect fossils indicate that some forms of insects have been in existence for over 300 million years. As a result of their long history and widespread occurrence, insects are highly adaptable and routinely exist and thrive, despite extreme weather conditions. Vast regions of the northern-most latitudes are well known for their extraordinary mosquito and blackfly populations despite having extremely cold winter conditions. The question then arises, how do insects survive such conditions? In short, insects survive in cold temperatures by adapting. Some insects, such as the Monarch Butterfly migrate to warmer areas. However, most insects use other techniques to survive the cold. In temperate regions like Georgia, the shortening day length during the fall stimulates insects to prepare for the inevitable winter that follows. As a result, many insects overwinter in a particular life stage, such as eggs or larvae. 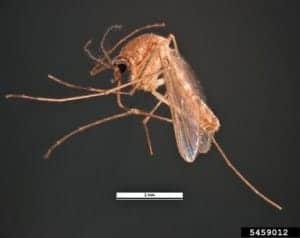 Many mosquitoes overwinter in the egg stage, such as our common urban pest the Asian Tiger mosquito (Aedes albopictus), waiting for warmer temperatures and sufficient water levels to hatch in the spring. Another technique is to take advantage of protected areas, as do adult Culex mosquitoes overwintering in the underground storm drain systems. 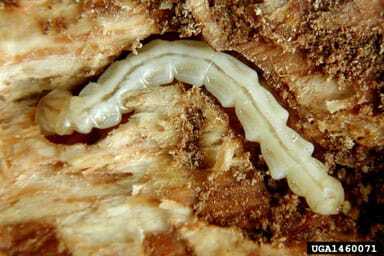 Other insects overwinter as larvae or pupae in the soil, protected from the most extreme temperatures. However, this still doesn’t answer how insects survive freezing temperatures, only to become active as warmer temperatures return. All insects have a preferred range of temperatures at which they thrive. As the temperature drops below this range the insects become less active until they eventually cannot move. A gradual decline in temperatures, coupled with a shortening day length, serves to prepare an insect to tolerate freezing temperatures. Several factors are important to this tolerance. The primary thing that an insect has to avoid is the formation ice crystals within their body. Ice crystals commonly form around some type of nucleus. As a result, overwintering insects commonly stop feeding so as to not have food material in their gut where ice crystals can form. This reduction in feeding will also result in a reduction in water intake. A degree of desiccation increases the concentration of electrolytes in the insect hemolymph (blood) and tissues. In addition, insects that can tolerate the coldest of temperatures often convert glycogen to glycerol. These electrolytes and glycerol create a type of insect antifreeze. This will lower the freezing point of the insect to well below freezing, a condition described as supercooling. When this occurs, the insect can withstand extremely cold temperatures for extended periods. However, at some point insects will suffer increased mortality, possibly due to desiccation, toxicity or starvation. Nevertheless, insects are well adapted to survive freezing temperatures, especially after a few 100 million years to perfect their systems. It is generally assumed that introduced pest insects from sub- and tropical areas would be more susceptible to extended cold spells, but depending on their ability to find local refuges and their numbers and adaptability, they likely will remain viable and persist as pests as well. In summary, entomologists don’t expect the cold winter to have a significant impact on insect populations this spring. Local conditions related to moisture and overall seasonal temperatures (early spring/late spring) will play a much more important role in insect numbers as we move from winter to summer and prepare for the insects that will be sure to follow. Sustainable nursery and IPM practices videos are now available online! University of Georgia and University of Florida have partnered to produce a series of short videos to help nursery producers to better understand and to more effectively use sustainable practices. You can find the list of videos and view them here. For more information on this project visit this site. 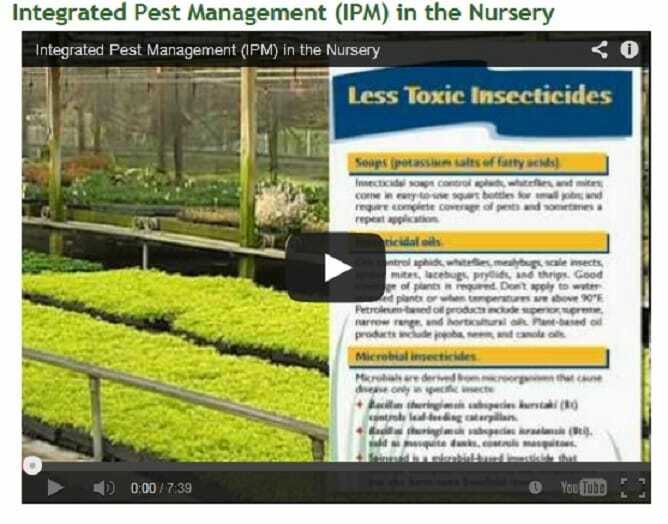 One of the latest videos covers Integrated Pest Management (IPM). The video includes an overview of IPM including sanitation, irrigation and sustainable pest management. See the IPM video here. Other topics are listed below. Visit the home site to view these videos. Information taken from the Southeast Ornamental Horticulture Production and IPM blog. Is there an unwanted invasive insect or plant on your farm or in your garden that you don’t recognize? The University of Georgia College of Agricultural and Environmental Sciences has an app for that. 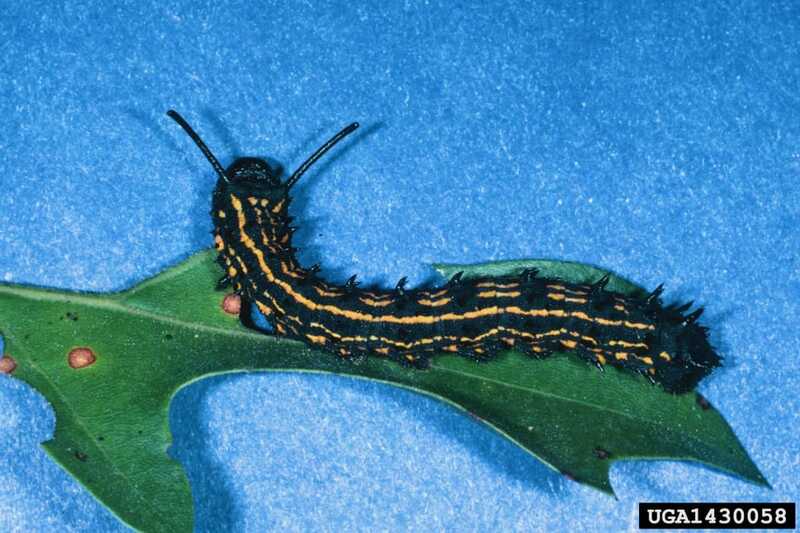 Invasive species trackers at the UGA Center for Invasive Species and Ecosystem Health have developed a suite of apps to help farmers, forestry personnel and home gardeners identify strange unwanted invasive pests. They can now identify their problem invasive pests in the field, rather than breaking away to sit down at a computer and look it up. Apps developed by the center’s technology director Chuck Bargeron and his co-workers provide direct links to different databases specializing in informing and educating the public about invasive species, those not native to an area that has been introduced and causing damage to agriculture and forestry. Such species include the kudzu bug that munches on soybeans and the spotted wing drosophila which affects blueberry crops. “For the IOS platform, we’ve had more than 25,000 downloads of apps. The most successful one was the first one we did which was for Florida, which was focused primarily on pythons in south Florida. It’s probably been the most successful because it had the most press coverage when it first came out,” Bargeron said. The app is one of 17 the center has developed. It provides different apps for different parts of the country because, for example, farmers in the Western United States aren’t concerned with the same species that growers in the Southeast are concerned with. Working a regional perspective allows users to focus on species in their geographic area. Bargeron and members of the Center for Invasive Species and Ecosystem Health have had great success with database web-based resources of information, especially after the pictures image archive were added to the website in 2001. When Keith Douce and David Moorhead, — co-directors of the center formally known as Bugwood Network, — launched the website in 2001 they added pictures from 35mm slides. Approximately 3,500 pictures were available. As more and more people began using the website and recognizing its value, they started sharing their own pictures. The database of pictures increased greatly in the 12 years since the website was started. Now, more than 200,000 pictures from more than 2,000 photographers are in the systems database. These resources have also changed the way forestry and agriculture classes are taught. An entomology professor at Texas A&M told Douce the resources caused him to completely restructure how he teaches his classes. According to Douce, the center website generated 9.3 million users last year and 260 million hits. For more information, visit the website at bugwood.org. Four mobile applications designed by University of Georgia specialists are putting lawncare information at your fingertips, literally. The turfgrass apps created by UGA College of Agricultural and Environmental Sciences faculty make turf management in Georgia readily available. Turfgrass Management, Turf Management Calculator, Turfgrass Weeds and Turf Management Quiz can all be downloaded from the UGA Turfgrass Team website at www.GeorgiaTurf.com or straight to a mobile device through iTunes. The most popular UGA turfgrass app is Turf Management Lite. This free app was created with students, homeowners and professionals in mind. It includes photos of turfgrass varieties, pests, weeds and diseases. Mobile applications, or apps as they are commonly called, can be downloaded onto smart phones like Droids and iPhones as well as portable tablets like iPads. “Back in 2009, mobile apps were fairly new to smart phones. We saw a great opportunity to put the information where it can be easily accessed by mobile phone, iPods and tablets, instead of publishing a telephone-book-sized publication,” said Patrick McCullough, a UGA turfgrass specialist based on the Griffin campus. The turfgrass apps are his brainchild. “Rather than have to go to the office and get an Extension publication or go online to view a publication, turfgrass professionals can now access the information they need in the field,” he said. There are three versions of the first app: Turf Management Lite, Turf Management Subscription and Turfgrass Management – Spanish. The lite and Spanish versions are free, but the subscription version costs $20 per year. The subscription version includes everything from the lite version, plus information on pest control applications and a pesticide database. “You can search for trade names as well, and it includes PowerPoint presentations from UGA turfgrass faculty,” McCullough said. The Spanish version is very popular in the turfgrass industry. “We have folks in the industry that speak Spanish as their first language. This app is a nice opportunity for those who are fluent in Spanish or primarily communicate in Spanish at work to have research-based turfgrass advice,” he said. The Spanish version has been downloaded in more than 40 countries across the globe. In 2011, the Turfgrass Management Calculator app was released. “It’s a comprehensive program that covers all types of applications, pesticide rates, fertilizer requirements, topdressing sand requirements, and calibration of sprayers and spreaders. Users enter known values of equations – like how much area is needed for a pesticide treatment at a certain rate. The app then does the calculation for you,” McCullough said. The calculator app costs $5 and includes more than 16,000 pre-programmed calculations. It can also convert units from standard to metric. “It’s really a great tool for turfgrass managers and professionals, but students can learn a lot from it, too,” McCullough said. The Turfgrass Weeds app was released in 2011. It is designed to help users learn turfgrasses and weeds through a series of flash cards. “The cards reshuffle so users can continue to study and learn turfgrass species and weeds,” he said. Just a few months ago, the UGA Turfgrass Team released its latest turfgrass app – Turfgrass Management Quiz. “This app is a trivia style education game. You get test questions or photos with four choices to answer. You tap the correct answer, and when you’re done, you get a quiz score,” McCullough said. The quiz app has two modes – quiz mode and study mode. Quiz mode scores your answers and study mode helps you get the correct answer. “This app is perfect for students, but it can also be used by any turfgrass professional who wants to brush up on their knowledge. It’s a fun application that challenges you to get the best score, improve on your score and test your knowledge,” he said. The new turfgrass apps are perfect for those who like to learn on their phones or mobile devices. UGA publications are also available online for computer users and in print form for those who still like the feel of a book in their hands. “(Mobile apps) are a new technology – a new method to get information in the hands of the end user. We are trying to make it easier for people to get UGA turfgrass recommendations so it just makes sense for us to create these programs,” McCullough said. To download the UGA turfgrass mobile apps or get more information on the turfgrass research at UGA, see the website www.GeorgiaTurf.com. Q: Something is chewing off the ends of branches on some of my trees. I go out every morning and there are three or four more on the ground. The leaves are nice and green on the fallen branch. Is it squirrels or could it be something else? A: What you are seeing is twig girdler damage. This is a long horned beetle (so named because his antennae’s are longer than his body). It is a pest of pecan and hickory, but may also attack persimmons, hackberries and other hardwood trees. The nature of the girdle itself distinguishes the twig girdler from other branch pruners and why I can tell it’s not a squirrel. The cut by the twig girdler is the only one made from the outside of the branch. The cut end of the branch looks like mini beaver damage. Since the twigs are girdled while the leaves are present, the severed twigs retain the leaves for some time. 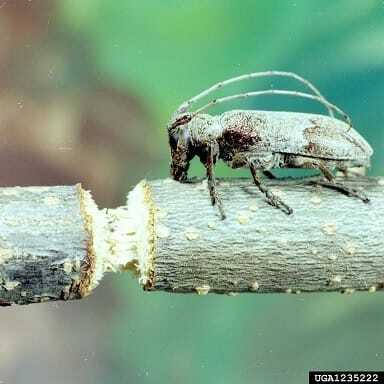 The adult beetles girdle twigs and small branches causing the ends to break away or hang loosely on the tree. It is not uncommon to see the ground under infested trees almost covered with twigs that have been cut off. The female lays her eggs in the tips of the branch then chews around the branch leaving a little wood attached in the center. This breaks off in the wind. If you look closely on the fallen branch you will see tiny holes where the eggs were laid. The holes will usually be by a bud scar or near a side shoot. They aren’t hurting the tree unless you had a pecan orchard, then the loss of branch tips could reduce nut production in the following few years. Most girdled twigs are from 1/4 to 1/2 inch (occasionally up to 3/4 inch) in diameter, and 10 to 30 inches long. The best control is to pick up the twigs and discard them as the larvae develop and pupate in them. Insecticide is rarely justified or practical. Editor’s note – The recent bee kill in Oregon and the resulting statewide temporary restriction of one of the neonicotinoid insecticides highlights the need to be careful in timing neonicotinoid insecticide applications and using these pesticides safely. Many homeowners may grimace at the sight of grubs, caterpillars or other pests lurking in their lawns, but understanding when and how to apply an insecticide to control these pests could have a big impact on native pollinator populations, according to a researcher from the University of Kentucky College of Agriculture, Food and Environment. Jonathan Larson, a UK doctoral student, has found that when neonicotinoids, a type of systemic insecticide, are applied to flowering lawn weeds that are frequented by native bees, such as dandelions and white clovers, the chemicals can negatively impact local pollinator populations. While honeybee population decline has received much attention, bumblebee numbers have also been on the decline. Much like honeybees, bumblebee population decline is related to diseases, pesticides and habitat loss or fragmentation. Larson’s research, published in the journal PLOS ONE, showed that exposure to clothianidin, a neonicotinoid insecticide, negatively affected queen production. It also slowed foraging and caused higher mortality rates in worker bees within five days after exposure at plots on UK’s Spindletop Research Farm compared to control hives. When moved to an untreated field to forage for six weeks, the bees had a hard time gaining weight compared to the controls. Bumblebees exposed to chlorantraniliprole, from a relatively new class of lawn insecticides, developed and reproduced normally compared to the control hives. He found that when clover flowers treated with an insecticide are removed by mowing and new flowers grew to replace them, neither insecticide adversely affected bumblebee colonies. “Direct contamination of the flowers is the problem, so homeowners need to remove the flower heads of weeds either before or after applying an insecticide to prevent exposure to native pollinators,” Larson said. 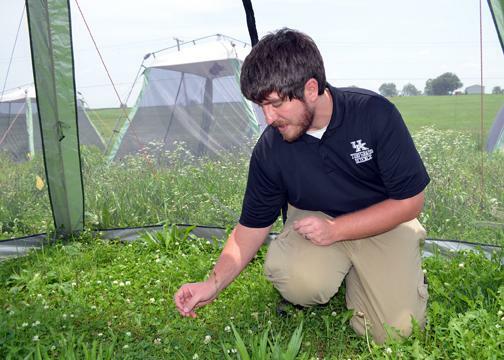 Larson is now studying the level of insecticides present in the nectar of subsequent generations of clover flowers after the field has been treated with an insecticide and the treated flowers have been removed. The entire PLOS ONE article is available here. The original release and photos can be found here. For years foresters and invasive insect experts have been on the lookout for the arrival of an unwelcome guest in Georgia. Now that it’s here, they hope the public will help restrict its spread within Georgia. 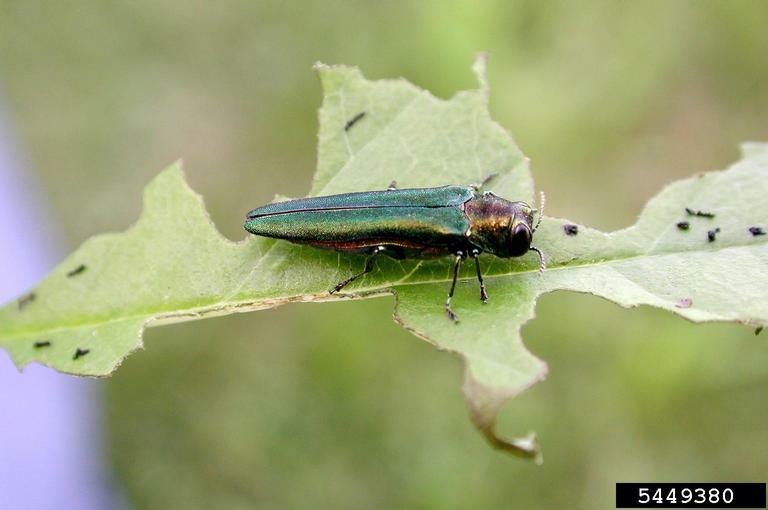 The small, iridescent-green beetle has killed millions of ash trees across a wide swath of Canada and the upper Midwest since it was first detected in 2002. The emerald ash borer — Agrilus planipennis— has spread south and west from infested areas over the last decade. In July, researchers found adult emerald ash borers in survey traps in DeKalb and Fulton counties. A follow-up ground survey found larvae in nearby ash trees, confirming an established emerald ash borer infestation. Since 2005 University of Georgia invasive species experts have conducted an extensive trapping program in Georgia to screen for the emerald ash borer. Georgia’s five species of native ash trees usually grow along stream banks. While ash only makes up about 1 percent of Georgia forests, they play an integral role in preventing the erosion of stream banks and keeping silt out of natural waterways. Ash is also a popular landscape tree, with 2.9 million trees planted around Georgia homes, businesses, parks and greenways. The value of these city trees in Georgia is estimated to be around $725 million. Although the adult beetle is an active flyer, it is believed that the primary way the beetle spreads is by hitching a ride on infested ash firewood, logs and nursery stock. 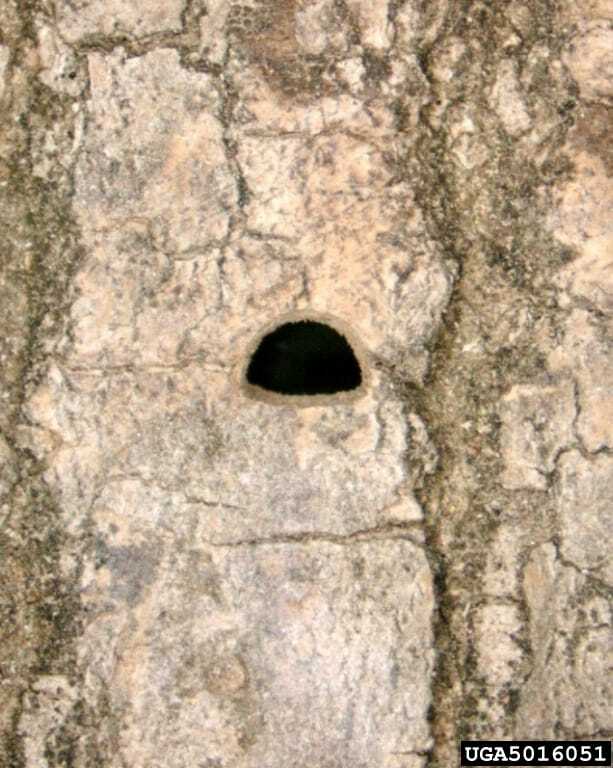 Emerald ash borer larvae kill ash trees by burrowing serpentine tunnels in the inner layers of bark, preventing the tree from transporting water and nutrients to and from the tree canopy. The Georgia Invasive Species Task Force will launch a public outreach plan to try to curb the spread of this pest in the near future. This task force consists of the Georgia Department of Agriculture, the Georgia Forestry Commission, UGA, the Georgia Department of Natural Resources and the USDA Animal and Plant Health Inspection Service. People can help slow the spread of this beetle through Georgia by not moving firewood and by helping others to understand how dangerous it can be to move firewood from one area to another. To help reduce the spread of the emerald ash borer in Georgia, homeowners with ash trees should have a certified arborist check their trees for signs of emerald ash borer infestations. Suspected infestations should be reported immediately so that foresters or arborists can understand how the infestation is spreading. This will aid in the development of effective methods to reduce its spread and impact. “The faster (scientists) can track the spread of the insect, the faster they can work to stop it,” said Joe LaForest, integrated pest management and forest health coordinator at the UGA Center for Invasive Species and Ecosystem Health. Using the SEEDN (Southeastern Early Detection Network) website www.eddmaps.org/southeast. Using the SEEDN Smartphone App (available for iPhone or Android devices) apps.bugwood.org/seedn.html . Emailing one of the Experts listed below; or by contacting a representative of the Georgia Forestry Commission, Georgia Department of Agriculture, the Department of Natural Resources or their local UGA Cooperative Extension agent. For more information about the emerald ash borer and how to protect ash trees, visit www.gainvasives.org/eab. For more information about spotting signs of emerald ash borer infestations, watch this. “Multiple factors play a role in bee colony declines, including pesticides. 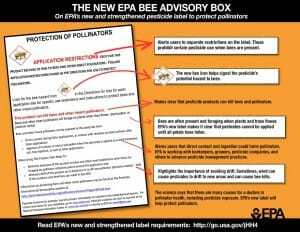 The Environmental Protection Agency is taking action to protect bees from pesticide exposure and these label changes will further our efforts,” said Jim Jones, assistant administrator for the Office of Chemical Safety and Pollution Prevention. The new labels will have a bee advisory box and icon with information on routes of exposure and spray drift precautions. Today’s announcement affects products containing the neonicotinoids imidacloprid, dinotefuran, clothianidin and thiamethoxam. The EPA will work with pesticide manufacturers to change labels so that they will meet the Federal Insecticide, Fungicide, and Rodenticide Act (FIFRA) safety standard. In May, the U.S. Department of Agriculture (USDA) and EPA released a comprehensive scientific report on honey bee health, showing scientific consensus that there are a complex set of stressors associated with honey bee declines, including loss of habitat, parasites and disease, genetics, poor nutrition and pesticide exposure. The agency continues to work with beekeepers, growers, pesticide applicators, pesticide and seed companies, and federal and state agencies to reduce pesticide drift dust and advance best management practices. The EPA recently released new enforcement guidance to federal, state and tribal enforcement officials to enhance investigations of beekill incidents. The photos present in this publication are intended to help foresters, urban landscaping employees, or others working with trees recognize some of the common pest insects affecting trees in North America and understand their life cycles and how they damage trees.